Pierre Moreau (born December 12, 1957 in Vercheres, Quebec) is a lawyer and a politician in the Canadian province of Quebec. Pierre Moreau was the Liberal MNA for the riding of Marguerite-D'Youville in the National Assembly of Quebec from 2003 to 2007. He ran again in 2008 in the nearby electorate of Châteauguay, and entered Cabinet. Moreau ran unsuccessfully for the leadership of the Quebec Liberal Party in 2013, coming second to Philippe Couillard. On April 7, 2014, Pierre Moreau was re-elected for a third consecutive term in Châteauguay in an election where the Liberals formed a majority government. On April 23, 2014, Philippe Couillard named him Minister of Municipal Affairs and Land Occupancy and Minister responsible for the Montérégie region. 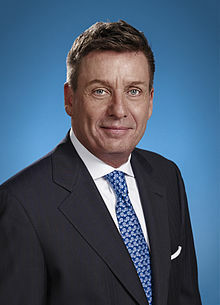 Born in Verchères on December 12, 1957, Pierre Moreau obtained a Bachelor of Civil Law from Laval University in 1980 and was admitted to the École du Barreau du Québec in 1981. He spent 22 years specializing in municipal and administrative law in a private practice in Montreal. He also shared his expertise by teaching at the École du Barreau du Québec from 1996 to 2002. He first entered the political arena by running for the Liberal Party of Quebec in October 2002. Elected as MNA for Marguerite-d’Youville on April 14, 2003, he successively served as parliamentary assistant to the Minister of Justice and Attorney General, as assistant Government House Leader, and as parliamentary assistant to the Chair of the Conseil du trésor and Minister responsible for Government Administration. In 2007 and 2008, Pierre Moreau held the offices of Chief of staff for the Government House Leader, and as Chief of staff for the Minister of Justice and Attorney General and the Minister of Public Security. Elected as MNA for Châteauguay in the general election held on December 8, 2008, he held the offices of Chief Government Whip from December 2008 up until February 2011. From February to September 2011, of Minister responsible for Canadian Intergovernmental Affairs and the Canadian Francophonie, and of Minister responsible for the Reform of Democratic Institutions and Access to Information. He was then appointed as Minister of Transports from September 2011 to September 2012. Pierre Moreau was, re-elected as MNA for Châteauguay in the general election held on September 4, 2012 and appointed as Official Opposition House Leader on April 9, 2013. On April 7, 2014, Pierre Moreau was re-elected for the third consecutive time in Châteauguay. On April 23, 2014, Philippe Couillard, named him Minister of Municipal Affairs and Land Occupancy and Minister responsible for the Montérégie region. On January 28, 2016 he was appointed Minister of Education but was on an indefinite leave of absence since February 22 following a tumour diagnosis. Sébastien Proulx replaced Hélène David as Minister of Higher Education and Lucie Charlebois as responsible for Montérégie until his return to work on January 19, 2017. Moreau was said by some pundits to be the heir apparent to the PLQ leadership until he lost his Chateauguay seat in the Quebec general election, 2018. Moreau earned second place in the 2013 party leadership race that elected Philippe Couillard. In December 2018, Moreau decided to not run for the leadership of the Quebec Liberal Party. ^ "Philippe Couillard announces emergency cabinet shuffle". CBC. February 22, 2016. Retrieved February 22, 2016. This page was last edited on 17 December 2018, at 02:11 (UTC).